FNUAcademic Advising BlogRadiologic Tech vs. X-Ray Tech: Which is Right for Me? Radiologic Tech vs. X-Ray Tech: Which is Right for Me? When you get to the point in life where you need to decide which courses you might like to take, it can be intimidating. Not only is it a big decision, but also so many of the degree programs sound similar to one another. How do you know which one is the right choice? If you’re considering pursuing an education in radiology or X-Ray reading, you might feel stuck trying to narrow down the right program that best fits your career goal. Are you stuck between deciding on the Radiologic Tech or X-Ray Tech programs? 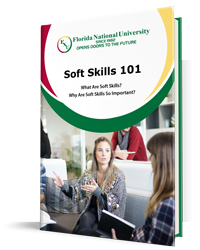 Florida National University (FNU) decided to take a closer look at these two programs to help you narrow down which path is right for you. If you’re having trouble distinguishing one from the other, learn a little more about these two programs now! Most students and prospective learners are already familiar with the two-year associate’s degree. Earned at community colleges and universities alike, an associate’s degree is often regarded as a faster way to enter one’s career, without attending school for the full four years. That’s why the first question that comes to mind is: What is a career education diploma? A career education diploma is often seen as a quick entryway into a career—whether part-time or full-time. While completing a career education diploma does not guarantee students a job, it serves to prepare them for a specific role. Career education diplomas provide the necessary training and information needed in order to successfully enter that related career. A career education diploma is a good way for students to enter a career when they don’t have a long timeline to dedicate to education. An associate’s degree typically takes students about two full school years (four semesters) to complete when taken full time, whereas a career education diploma might take just about half that time. While students do not have a degree at the end of the program, they do earn a diploma, certifying that they are qualified to work in their chosen industry at an entry-level position. From there, students can continue to learn and grow in their respected academic area of interest, having the opportunity to accelerate in their fields without earning an associate’s or bachelor’s degree. This is dependent on the field one chooses to enter, the training received at their job, and the company’s policies. Although it’s not an option for every student, based on personal circumstances, some students opt to put forward, dedicating the extra time it takes to learn more while in school. They choose to earn their associate’s or even bachelor’s degree, which gives them the opportunity to begin at a higher position, working their way up the ladder from there. Often, a more advanced degree will lead to a higher earned salary. However, keep in mind that students who entered their careers sooner—after completing a career education diploma program—have had that time to gain hands-on experience, and possibly earning more money through raises and promotions depending on performance. Overall, there is really no one way in deciding which option is best for an individual. This decision will ultimately depend on a student’s personal goals and what they hope to accomplish. Additionally, each student’s timeline is going to be different from his or her peers according to their amount of availability they have to dedicate to their education. That is why with the help and support of FNU counselors, it is critical for an FNU student to determine which program works best for them. The purpose of the Basic X-Ray Technician program is to prepare the student to obtain the knowledge and perform the duties, and uphold the responsibilities of a basic X-Ray machine operator. This program offers the knowledge and skills necessary for doing radiologic work on the extremities and chest. The student will be trained to a high level of professionalism in communicating, caring, and protecting the patient during the taking of X-rays, and will have good knowledge of medical terms. The program also prepares the student for the State of Florida Basic X-Ray Machine Operator Licensure Examination.. The Radiologic Technology Program is the next step for students who have completed the aforementioned program and wish to continue their education. It is also a highly recommended program for students who are just beginning their education in particular area of study. The program prepares the student, upon successful completion of the National Certifying Examination by the American Registry of Radiologic Technologist, for a position as a member of a health care team in a hospital, clinic, or physician’s office. The degree can also be used in other areas in the medical industry such as the manufacturing and supply of medical equipment or management. In addition to being prepared to take the National Certifying Examination by the American Registry of Radiologic Technologist, this program is also designed to prep students for the State of Florida Department of Health and Rehabilitative Service General License Examination. To enrich this particular curriculum even more, this program also includes a 15-credit-hour component of general education and liberal arts courses. FNU is dedicated to promoting students’ success. We understand that students might want to continue learning and excelling. We also understand that there are also other life commitments. This is why we offer our students a vast array of educational programs in different subjects that can be completed in a short period of time. Learn more and apply to FNU now!